While we were planning our wedding, it quickly became clear just how big of a part other people played in making things happen. I saw generosity from our families and friends like never before, and we were often at a loss for words with how many amazing people were in our lives. We had quite a large bridal party (7 on each side), and I wanted to put together a special gift for each of my bridesmaids to thank them for putting in so much time and effort for us. After considering a few different options, I decided to curate gift boxes with a focus on mostly local products that were beautiful and of quality. I wanted each item to be thoughtful, purposeful, and hopefully useful to the girls as well. Click through to see what I included! 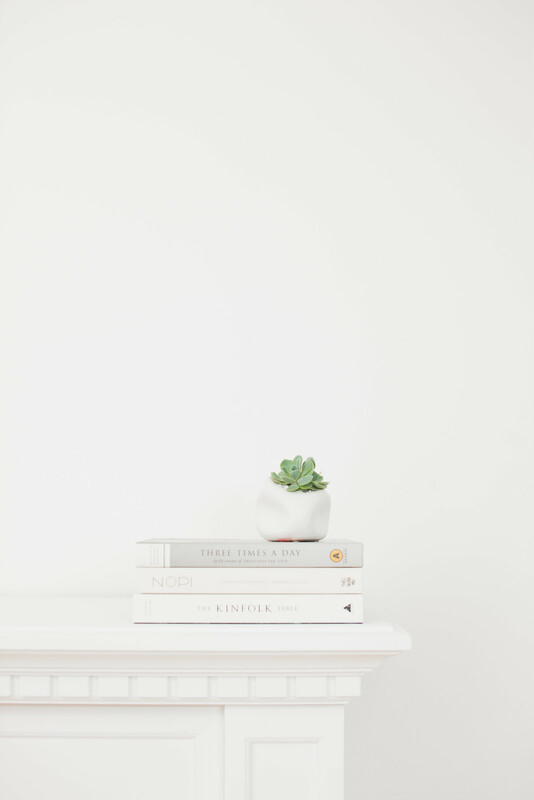 Soy Candles | Vancouver Candle Co.
A well-made candle is something I always enjoy but would never splurge on myself, which is why I feel like they’re the ideal gift to give. There’s something so luxurious about relaxing with delicious smelling candle on a quiet night. 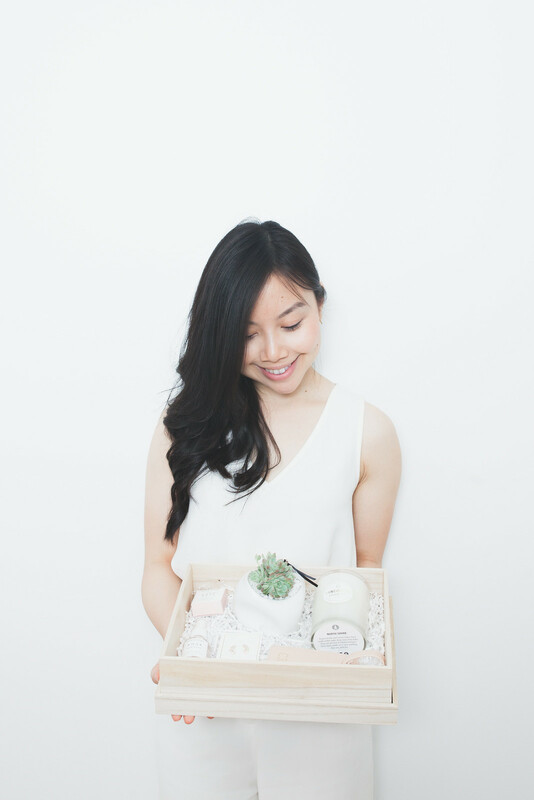 The brand I chose is local to Vancouver, and their candles are inspired by various neighbourhoods around the city (they also just launched a Toronto version!). I chose 7 different candles and paired them according to what the neighbourhoods are known for and who they reminded me of. As a blogger, I get to try my fair share of beauty products. Naturally, it takes a lot for something to really stand out, and Herbivore Botanicals definitely has for me. I was first drawn to the Seattle based brand’s beautiful, simple packaging, but when I found out that the outside actually reflects the inside (pure, simple, natural ingredients), this made me love it even more. I chose the Coco Rose lip conditioner and Rose Hibiscus face mist for my girls – both versatile and soothing products that work on all skin types. I have a black thumb and have killed basically every plant I’ve ever owned, but these lovely little succulents make me want to try again. 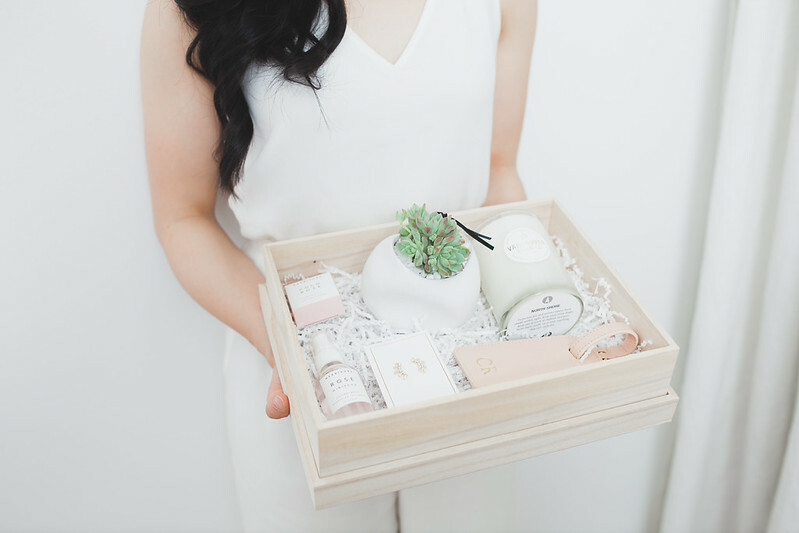 Another Vancouver based company, Botany Living is run by two talented women who have create simple, sustainable plant arrangements that add subtle beauty to homes. These minis from their Uno collection added the perfect pop of greenery and life to an otherwise largely colourless gift box. Over the years I’ve become increasingly minimal when it comes to jewelry — for about a year and a half, I’d worn the same pearl earrings basically every single day. I discovered this Vancouver-based brand while browsing a local boutique a few months ago, and when I found these very affordable, very chic earrings my pearl streak officially ended. I’ve owned them for about 3 months now, have worn them almost daily, and they’ve held up beautifully. I loved picking out individual pieces from the brand that I felt reflected each of my bridesmaids’ styles. I’ve had a long time partnership with this New York based leather goods brand who makes some of the most well-used bags in my closet. 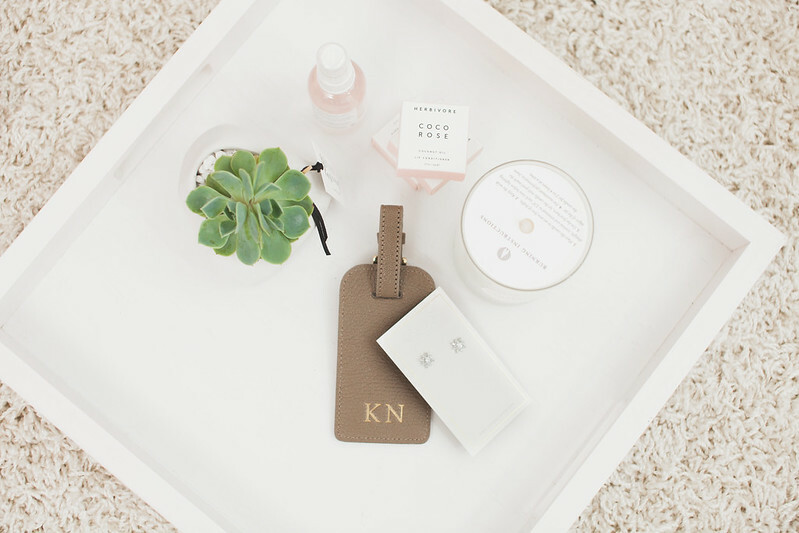 I loved the idea of giving my bridesmaids something personal and special that they wouldn’t necessarily buy for themselves, so I had their initials monogrammed on leather luggage tags in colours that I felt like reflected their style. I was so happy with how everything came together, and loved watching my bridesmaids’ reactions as I gave them their gifts! I also really appreciate that these boxes can be done on any budget and are completely customizable. Good question! I use my face mists in a few different ways – to refresh my skin on hot days, to set my make up when it’s done, and sometimes after I wash my face if it feels ‘tight’. Super versatile product that just feels good anytime! Could you provide some deets on your outfit as well? I love the all white outfit!